Walked Mix and breakfasted before setting off for Gavinton Church for the Remembrance Sunday Service. Found the Church door closed – the heating had failed and we all worshipped in the Church hall (which was rather nice as the hall was absolutely full and also very warm). 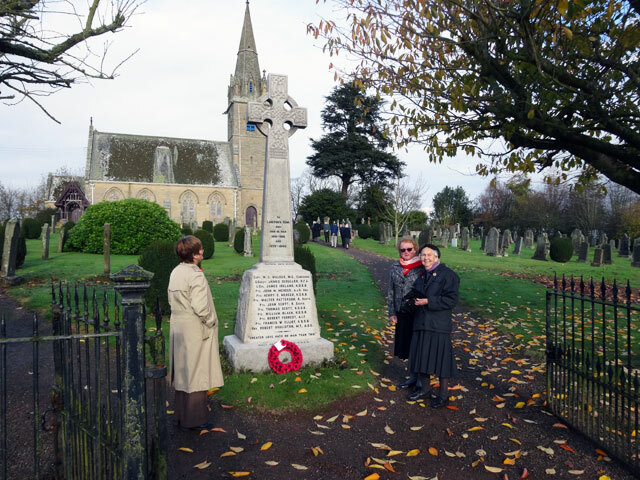 After Ann had reminded us of the importance of remembering and shared two special meditations with us, we all made our way to the memorial where Mum had been chosen to lay the wreath. We made our way back to the hall for coffee and then back to Mount Pleasant where David and I fixed a plank in the Bothy which required a bit of remedial attention. David went off and we all dined in the farmhouse before I drove along to Fogo for the afternoon service. I thought that it was at three but there was no-one there. However as there was no wreath in front of the memorial there and because the heaters were on in the Church, I deduced that the service was still to come. And it did, at half-past three. I was glad I had waited to share in the service again, naturally, on the theme of remembrance and again followed by the laying of a wreath at the memorial. Back home I got my bits and pieces in order for my trip to Canterbury tomorrow. Rachel went off to Evensong in Berwick and on her return we had a snack before Olive and Mum joined us for the final part of Downton Abbey – I gather we still have a Christmas special to which to look forward. I walked Mix and retired to bed. Tomorrow will have an early start. Amazing to think that twenty-five years ago today the Berlin wall began to crumble.